Every time we serve this with The Healthy Holiday Company a lot of the clients ask for the recipe, so here it is.This has turned even the most die hard muesli haters on. 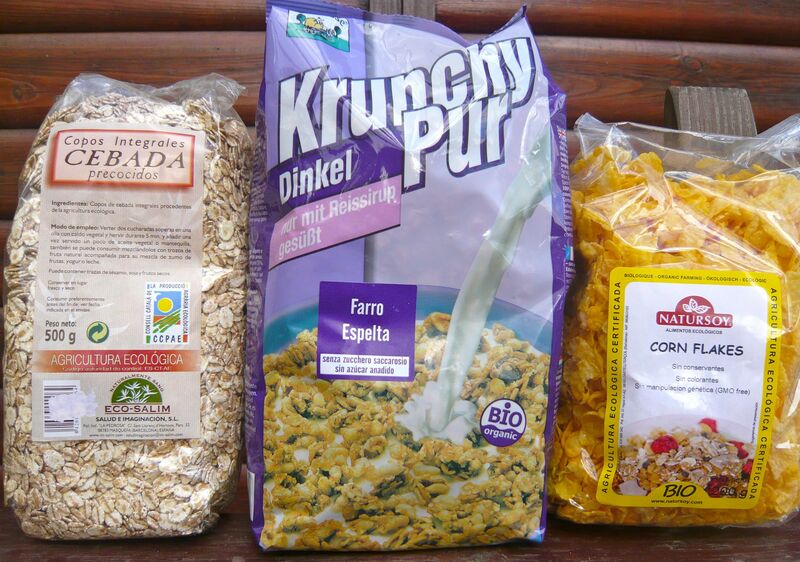 Granolas and mueslis from the healthfood shops can be expensive and you don´t get much for your money. This recipe will make 2kg of muesli. If you eat it every day it will last just over three weeks. 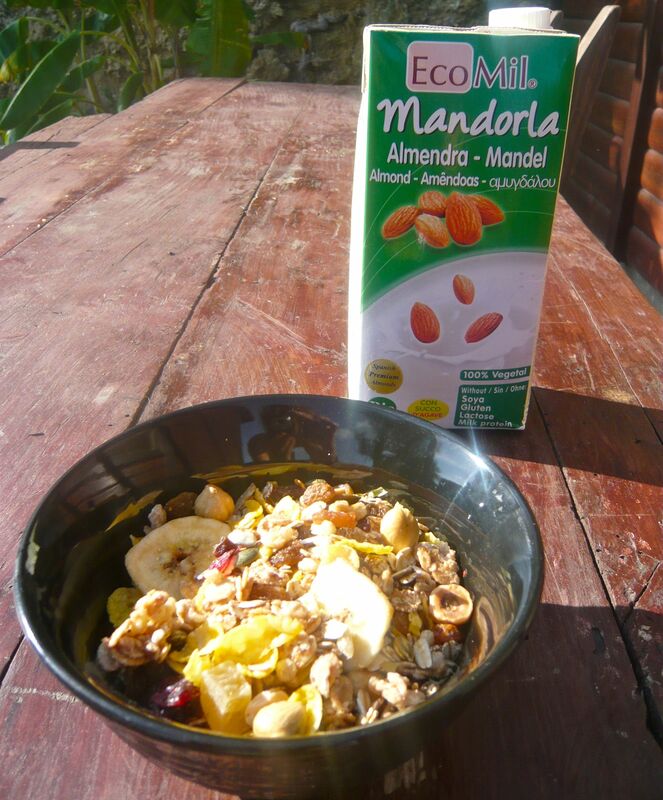 Making a customized muesli such as this is win win as its cheaper, better than the generic ones and you can add extra things you like. Turn the oven on to 200 degrees. Place the oats and the dessicated coconut onto a large baking tray and place into the hot oven for around 20 minutes. These will toast a nice golden colour, but you will have to keep moving the mix around so as to avoid burning on the top. You will probably have to do it three or four times in the 20 minutes. Remove from the oven and leave to cool. Place the hazelnuts onto a sepearate baking tray and toast off at the same time. They will need 8 to 10 minutes – this is to release the full flavour of the nuts. Place a large frying pan onto a high heat. 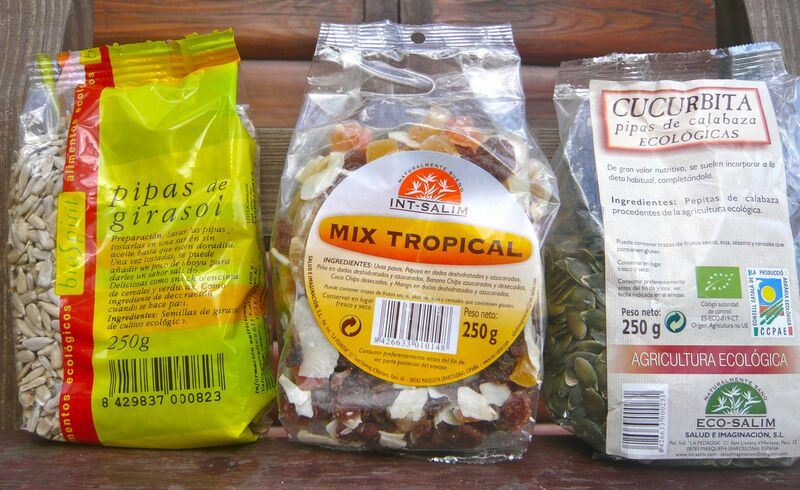 Add the pumpkin and sunflower seeds (do not put any oil – this must be a dry pan) and toast them off. The pumpkin seeds will start popping – this is fine. 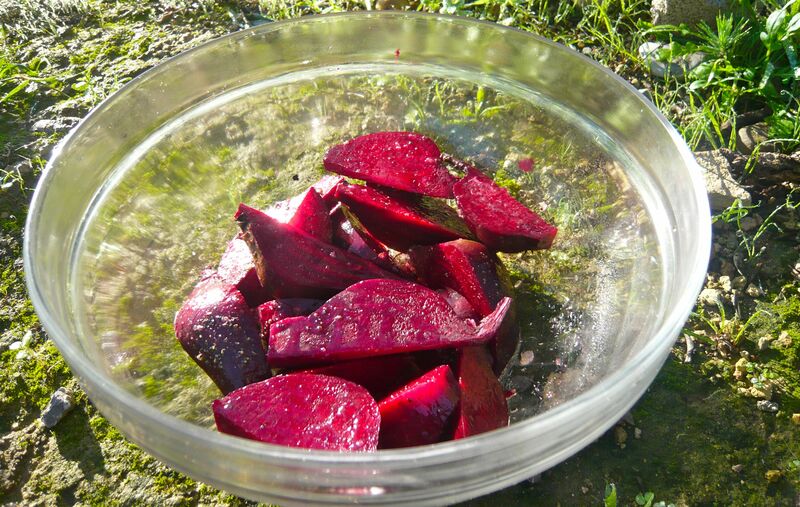 Once they have a nice colour, remove from the pan and leave to cool in a bowl. 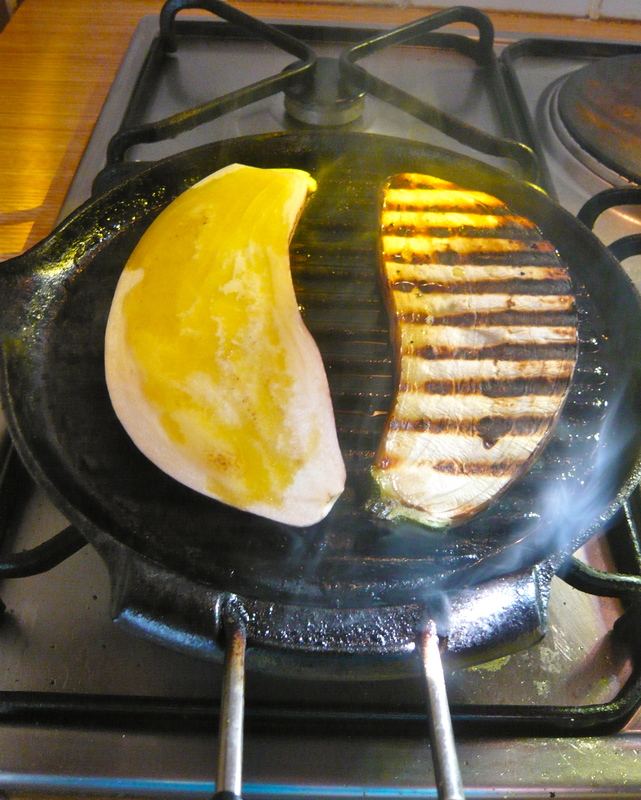 Don´t leave them in the pan as they will continue toasting in the pan, and this is how they get burnt! Then do the same with the sesame seeds. Take a large mixing bowl and add all of the ingredients and mix well. 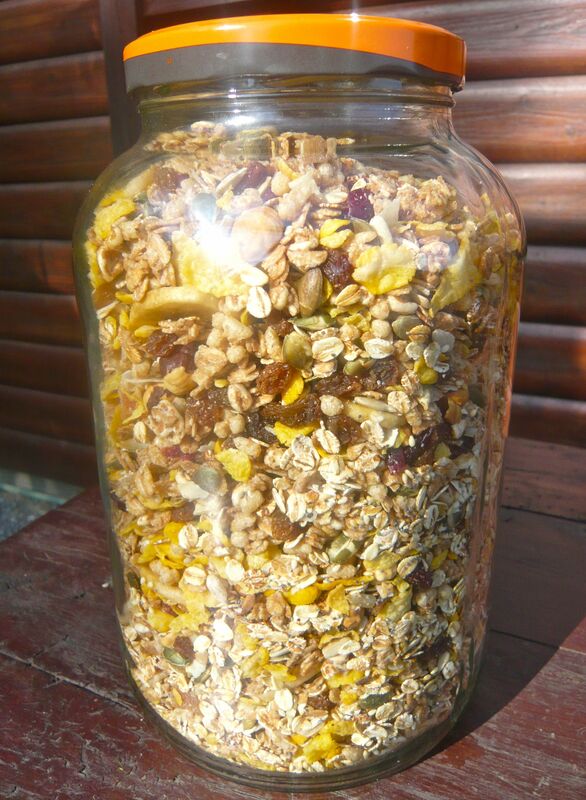 You could keep this muesli in a tupperware container, ziploc bags or a large glass jar. Delicious with alternative milks such as hazelnut or almond. 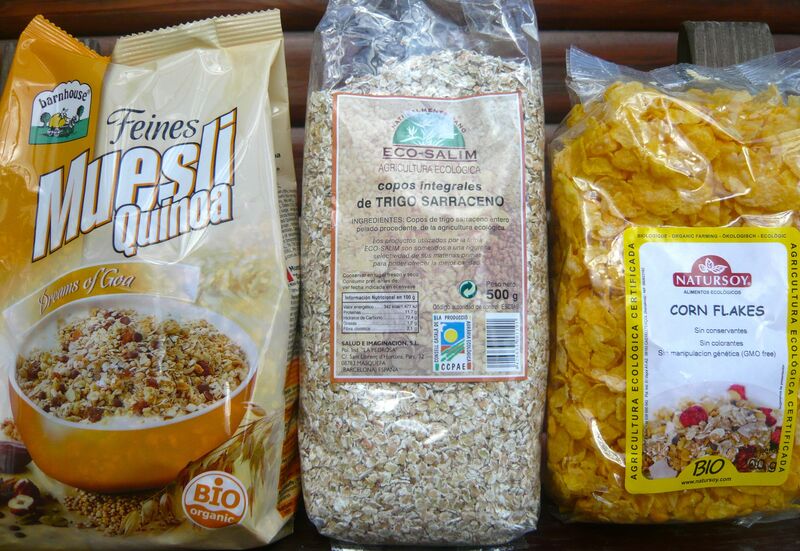 For a gluten free version of this use alternatives such as buckwheat, millet and quinoa in place of the oats and spelt. Soup is always good this time of year (Autumn). I like soups that focus on one or two flavours. This is a recipe that brings the red peppers to the front with a hint of paprika following. You don’t have to peel the peppers, I just do because it adds another subtle level. This is not a blended soup. 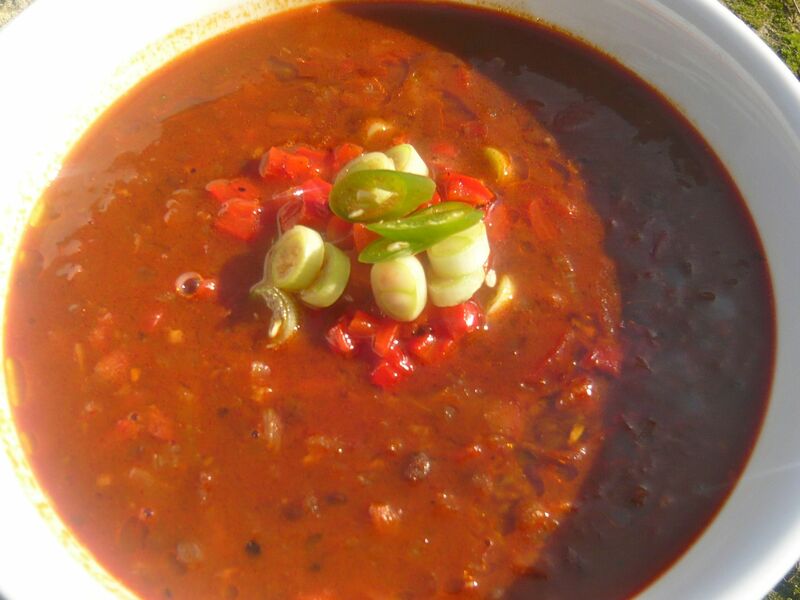 It will happily sit on a low heat bubbling away working everyones appetite with its permeating aromas. This recipe feeds about four people. Cover the bottom of your pan with olive oil and fry off the onions. Add the garlic when the onions start to brown, then the chopped peppers (hold a little bit back for the garnish). Cook this down for five minutes, add the paprika, then the stock. When this is bubbling happily, slide in the lentils. Keep the soup boiling, add the grated apple then turn down to a simmer. Keep topping up the soup with warm stock or water from the kettle, so it stays a soup like consistency. After 45 minutes, taste the lentils, if they are soft, turn off the soup, leave for half an hour then taste for seasoning. Sometimes the lentils go a little bit hard, not sure why yet, but just cook it a bit more until they soften. When you are ready re-heat and serve. To garnish like the bowl in the photo, I took some of the red pepper that I held back and cut as small as possible, chopped one spring onion and half a chilli. Its that time of year where we have time to indulge in such luxuries as cake making. Smells filling the house, warming it up rather than over heating it (we live in Spain). This is a Nikki recipe. We are experimenting with different no gluten flours that are not heavily processed like some of the branded gluten free flour on the shelves. Pumpkin is really popular with cakes and desserts in the America. 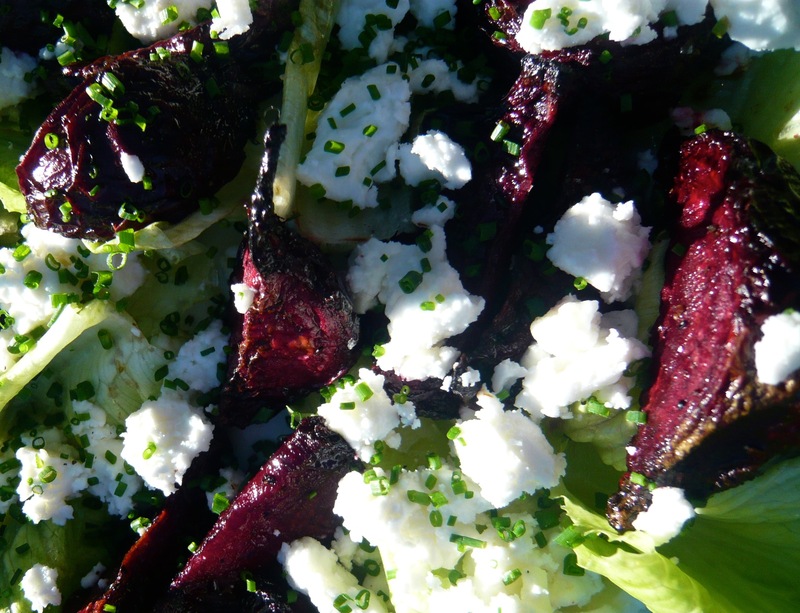 In Europe we tend to go for different roots like carrot or beetroot. This cake is dense and will last forever getting better day by day. It would of been called ‘hippy cake’ where I am from, not that thats a bad thing. 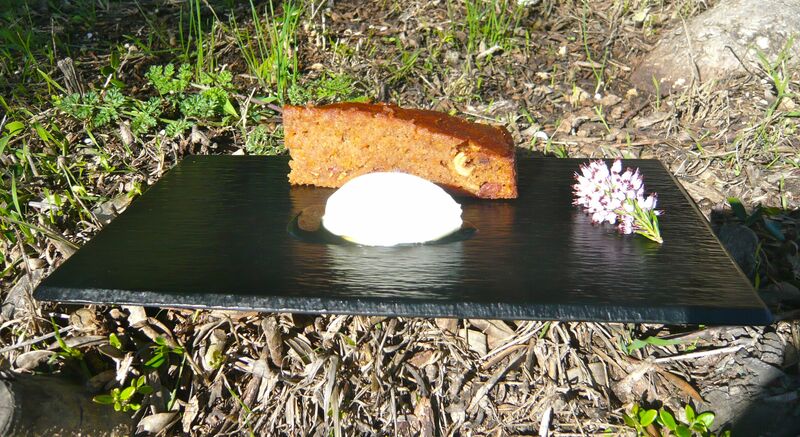 Its the chestnut flour that gives it that texture. I really like it for its longevity and it can also double up as a winter dessert. Serve it with yoghurt and honey or yoghurt agave or vanilla ice cream. Failing that it works really just with a cup of tea. 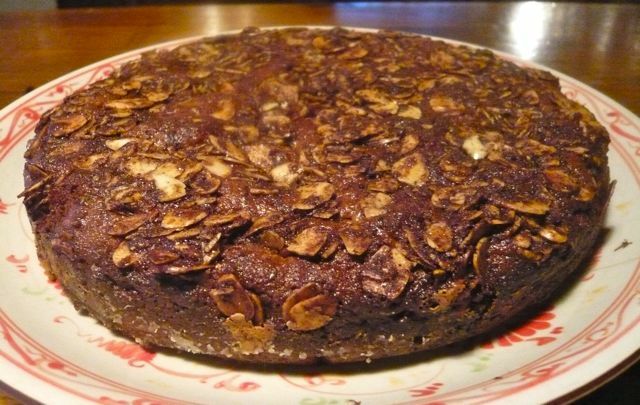 If you find this cake a little dense or you cannot find chestnut flour, you can use ground almonds instead. Preheat the oven to 175 degrees and grease, line and flour (with the chestnut flour) a 23cm (9 inch) springform cake tin. Sieve the flour, ginger and baking powder into a large bowl. Whisk together the eggs, oil and sugar in a seperate bowl until mixed well. Fold the egg mixture into the dry mix and add the carrots, raisins and hazelnuts. Pour into the prepared cake tin and cook for 50 to 55 minutes. If you insert a wooden skewer into the middle of the cake it should come out completely clean, and feel firm to the touch in the middle. Leave to cool in the tin for at least half an hour before transferring to a plate. In the photo it has been served with Quark and a drizzle of agave. 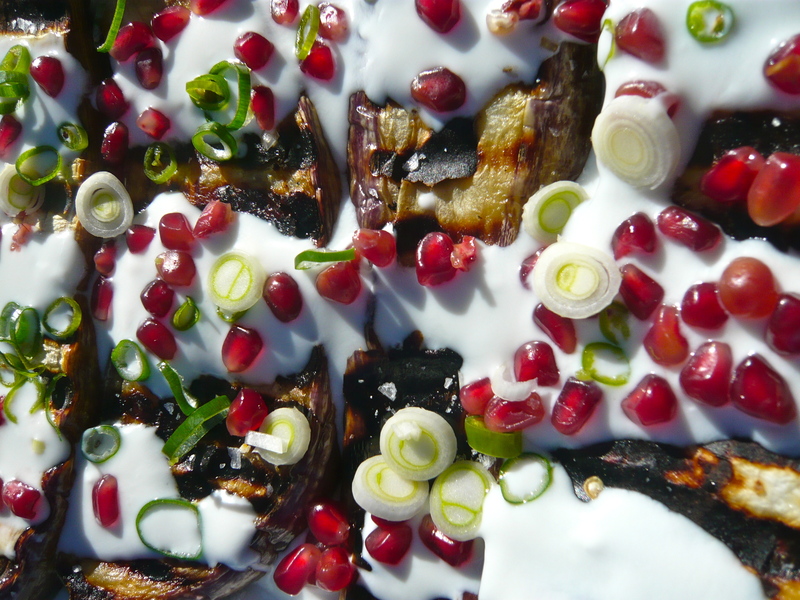 Dab off any oil from the aubergine with the kitchen paper then lay onto a large plate. Put the yoghurt into a bowl and mix a teaspoon of lemon juice, salt and pepper. Cut the spring onions and the green chillies into rings, not too thick. Empty the seeds out of the pomegranate. 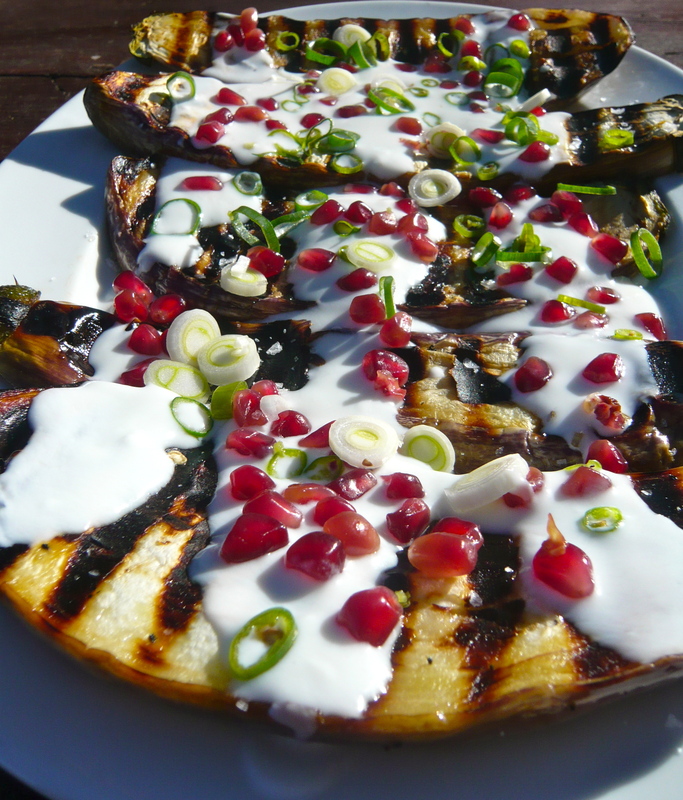 Dress the plate when it is ready to go to the table by evenly drizzling the yoghurt over the aubergines, sprinkle over the spring onions and green chilli then finish with the pomegranate. There are no problems prepare this dish in advance. Here’s the thing; if you put 250ml of double cream into cauliflower soup, like every other recipe I have read, then for sure you will have a rich and scrumptious soup. That soup will also be intensely calorific. 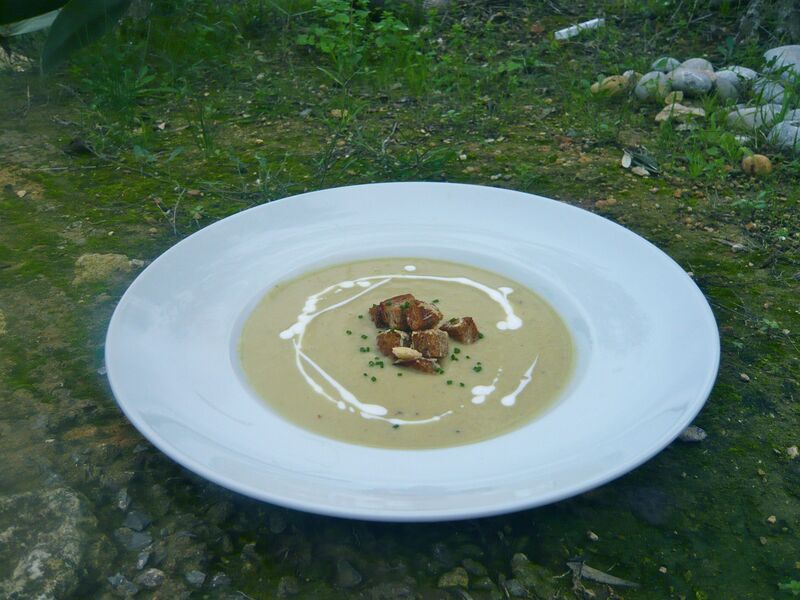 This is a lighter soup relying on the cauliflower being cooked properly and not stewed. This alongside the addition of the mustard which adds some depth and a small amount of zero yoghurt finished off with a scratch of parmesan on the croutons (which can be left out if you wish) gives it depth and richness with out the fat content. Roughly chop your onion and cauliflower keeping them seperate. Take a good pan and cover the bottom with the oil, place onto a mid heat and sweat off the onions. Try not to brown them as this will colour the soup the wrong way, you want it as light as possible. Add the garlic and cauliflower, keep stirring for 5 mins then cover with stock. Let this cook out for about half an hour. Meanwhile prepare the croutons. Heat the oven to 200 degrees. Cut the bread into small squares, toss with some oil. Put on to a baking tray lined with paper. You only need enough for about 8 squares in each bowl. Toast off in the oven when they are ready take out and scratch some parmesan over them. Put back in for another minute. Put to one side until the soup is ready. Take a stick blender, a magi-mix or a smoothie maker, and blend the soup until really smooth. Add the mustard and blend some more. If it is a little bit too thick, alter the consistency with some more of the stock. Knock down the yoghurt with just a little water so it is more of a pouring consistency. To serve; Pour into a bowl, place a big pinch of croutons in the middle, then draw a circle of yoghurt around the croutons for a nice cheffy finish. Young thyme leaves or chives work well with with this soup sprinkled onto the croutons. 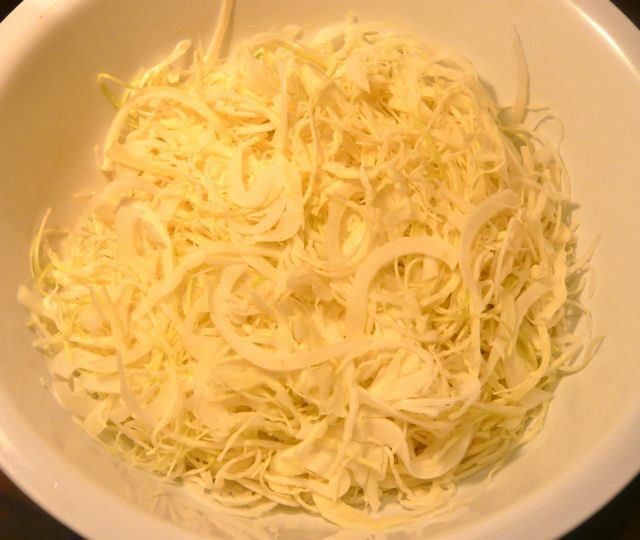 I have always liked sauerkraut, is good to know that it is highly beneficial to people who have digestive troubles. 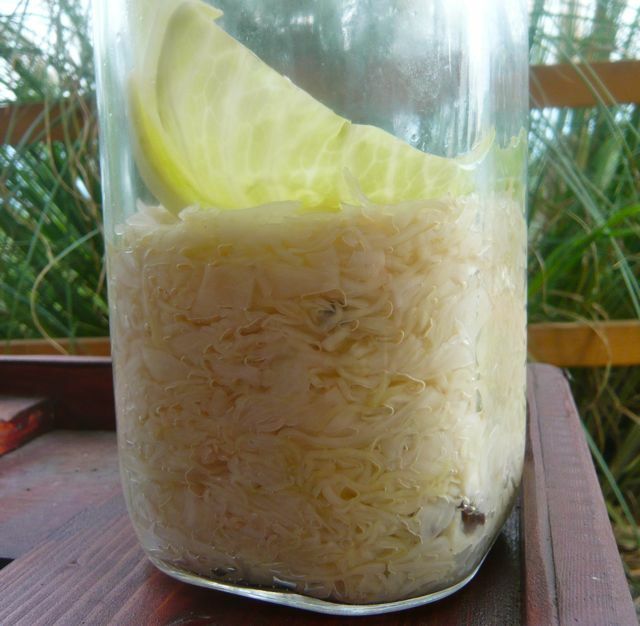 The lacto-fermentation process it goes through means it is a natural probiotic. Natural probiotics aid the digestive and immune systems. The effects sauerkraut has on your insides are quite complex in contrast to how easy it is to make. The bottom line is that its good for you. Eat it with all your plates of food or with crackers, just integrate it into your diet. Add aromatics, classically juniper berries, but all spice and star anise work really well. What you see in the photo is one medium cabbage, probably better do it with two or three, it keeps for a couple of months. Cut the cabbage into four, removing any of the outer leaves which are no good. Save a couple of good, large leaves as this will go on top of the cabbage in the jar to hold it down. Remove the thick stalk in the middle. You need to cut the cabbage as thin as you possible. A mandolin is the right tool for the job, if you don’t have one then a heavy knife and a steady hand will do it. Give the cabbage a rinse, and dry fairly well. Add it to a large bowl and scrunch in a tablespoon of salt. You now have to pick up handfuls of the cabbage and give it a good squeeze. Drop this handful and pick up another one. Repeat this process until water starts coming from the cabbage. Carry on until it has reduced in volume by half. You can now add your spices. Pick up handfuls of the cabbage and press firmly into the jar, watching out for any air pockets. Once firmly packed, pour the liquid in. This is the brine, and will prevent it from going off. All of the cabbage should be covered. Press the reserved cabbage leaves on top, close the jar and leave for 24 hours at room temperatute. 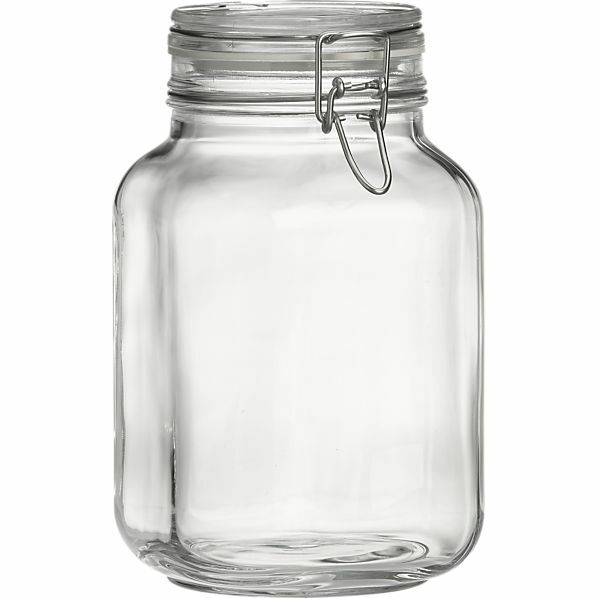 Over the next four days open the jar once a day just to release any excess gases. After four days, put into the fridge for a couple of days. 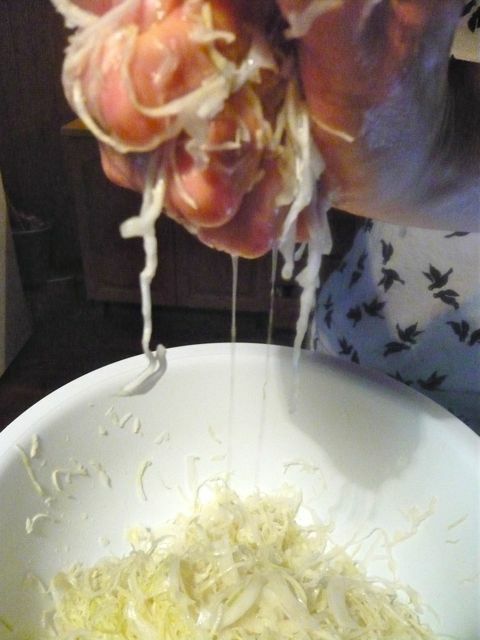 The sauerkraut is now ready and will last for approximately two months, although this recipe only produces a small jar, so it won´t last that long.